79 People Are Believed Dead In London's Grenfell Tower Apartment Fire : The Two-Way For police, fire and emergency crews inside the tower, "it is incredibly emotional working in there," Metropolitan Police Cmdr. Stuart Cundy says. 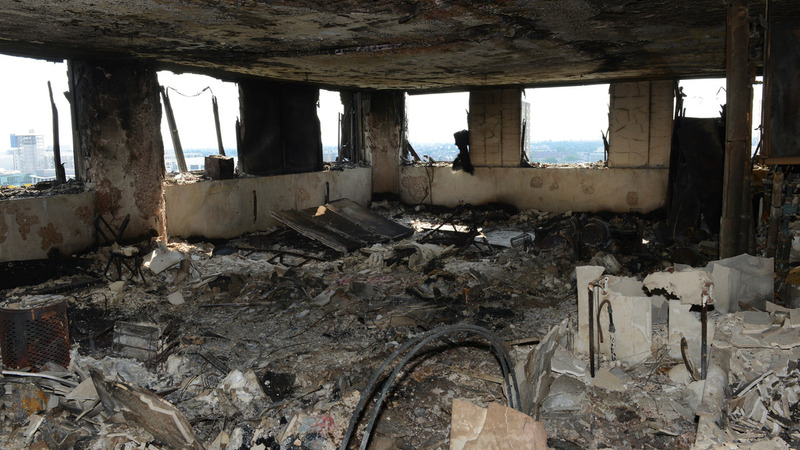 A photo released by the Metropolitan Police shows a view of an apartment in the Grenfell Tower, which was devastated by a fire last Wednesday. "I'm afraid to say there are now 79 people that we believe are either dead" or presumed dead in London's Grenfell Tower fire, Metropolitan Police Cmdr. Stuart Cundy said Monday morning, in an update on the huge fire that overtook a 24-story building last week. "Sadly, for many families, they have lost more than one family member," Cundy said. "This is an incredibly distressing time for all of them." Only five victims have been formally identified, and Cundy said that because of the fire's intensity and the devastation it caused, authorities may not be able to identify everyone who died. Over the past few days, another five people who had been reported missing in the fire have been found to be safe and well, Cundy said, saying he's "so grateful" for the news. On the same morning Cundy delivered his update on the fire, a moment of silence was observed in honor of those it has affected. Cundy said it was hard to describe what he saw when he went into the building on Saturday. "I've investigated major crime for most of my service, and I've seen some terrible things. But I don't think anything prepared me for what I was going to see when I was in there," he said. Search and recovery crews have been working in the tower since last Wednesday's fire. For police, fire and emergency crews inside the tower, "it is incredibly emotional working in there," Cundy said. He expects the operation to last "many, many weeks." Dozens of people have been reported missing since last Wednesday's early morning blaze that struck while many who live in the building's 120 apartments were asleep. Providing an update on the situation Monday morning, police said the death toll may rise further. 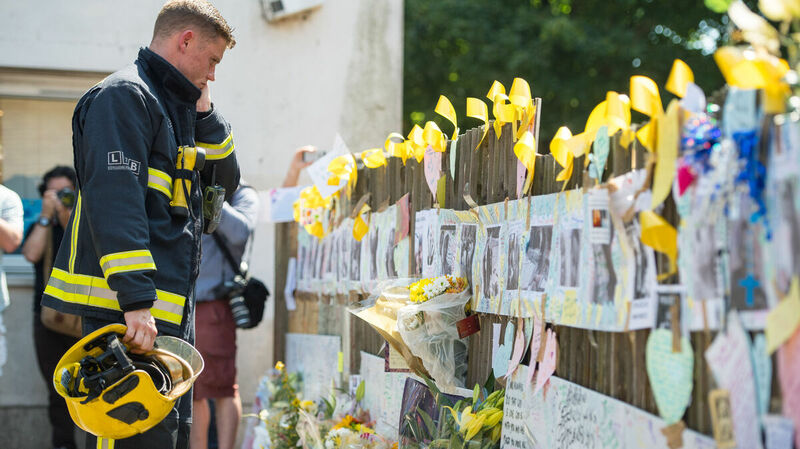 A firefighter looks at tributes to presumed victims of the Grenfell Tower fire, after observing a minute's silence at a community center near the apartment building in west London. The fire triggered both sorrow and outrage, as residents described the futility of their earlier attempts to have the building's safety issues addressed, particularly its fire escape plan. Many questions also center on the speed at which the fire spread. Records have shown that in a renovation a few years ago, the building was re-clad with siding that may have had "a polyethylene core," rather than a more fire-resistant mineral core, as NPR's Frank Langfitt reported. The job's contractor has said the work met all fire standards. The investigation into the fire will span a "wide range of areas," Cundy said, from its original construction, to the refurbishment and how it has been managed and maintained. While he refused to speculate on the inquiry's outcome, Cundy said, "I would like to reassure everybody that we will be looking at all criminal offenses that may have been committed by any individual or organization."